I mentioned a few posts ago that I might try to record some sound samples of one of my guitars in the white (ie. before finishing), and then again after French polishing. The point would be to convey the effect that the finish can have on the sound of a guitar. I've always found it fun and interesting to hear the same guitar before and after finishing, so hopefully you're able to hear something interesting in these samples and maybe even learn a little something. Isn't the finish just there to protect the wood? The fact is that the finishing material (eg. French polished shellac, oil varnish, nitro lacquer, polyurethane varnish...) and the way/thinckness that it's applied drastically impacts the sound of an instrument. Beyond protecting the wood, in the case of my guitars and I believe of any good luthier built guitar, a finish is actually vital for refining the sound - bringing out the resonance, the brilliance, making it louder and more sustaining, and for taming down the raw, boxy tone of unfinished wood. However, the amount of finish needed, especially on the soundboard, in order to achieve these positive acoustic outcomes is exceedingly minimal. Applying such a thin film requires it's own skill set and a lot of care. 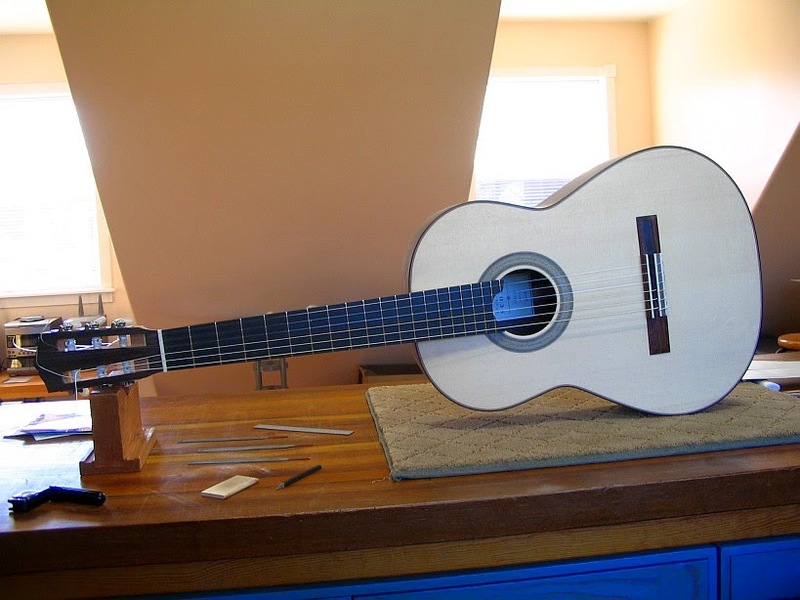 Excessive finish is a major reason why factory built classical guitars rarely sound as open, loud, responsive or dynamic as luthier built instruments do. French polish is the only good instrument finish that naturally goes on so thin. Using traditional technique it would be almost impossible to build up too much finish. This is of course why French polish is the most accepted finish on a classical guitar, at least on the soundboard. When I've tried to measure my thickest French polish it's in the region of .0005" - .001" thick. An average French polish is easily thinner than that. On the other hand, any brushed or sprayed varnish or lacquer has the opposite tendency and you'd be very lucky to achieve a film as thin as .003". Factory finishes are usually no less than .010" and can be as thick as .040", that's a full millimeter!! The recordings were made with an LS10 pocket recorder (not the best mics). I was careful to change nothing between the before and after recordings, although they were made about 3 weeks apart. The same strings were used, the same record level, and I was careful to sit in the same spot in the room with the mics in the same location as well. If you had played this guitar yourself the differences would have been immediately obvious but, as I suspected, in these recordings the differences aren't as easy to pick out. I'd be very interested to know what you notice in the comparison. Feel free to email me with your thoughts.